This hotel was very clean and well kept. The staff was friendly and accommodating as well. Location is perfect and lots of restaurants within walking distance. Older but well kept. Where to find Hagerstown hotels near an airport? Where can I find hotels in Hagerstown that are near tourist attractions? You will find yourself spoiled for choice when it comes to securing great places to base yourself in Hagerstown. If you are looking to stay within a 0.1-kilometre (0.06-mile) distance of the heart of Hagerstown, Expedia's up-to-the-minute database features no less than 20 places to base yourself that meet that criteria. Enjoy staying within walking distance of the heart of Hagerstown. Accommodations in the area include Clarion Hotel and Conference Center Hagerstown and Comfort Inn & Suites Hagerstown. Budget-concious travelers can relax. 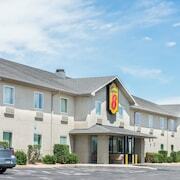 Hagerstown provides a good selection of economical hotel establishments. 0.9 kilometres (0.6 miles) from Hagerstown's downtown area you'll find the Best Western Grand Venice Hotel Wedding & Conference Center. The Super 8 Hagerstown Halfway is just 6 kilometres (3 miles) away. 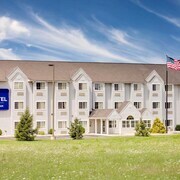 Other options in the lower price range of Hagerstown hotels include the Red Roof Inn Hagerstown - Williamsport, MD and the Microtel Inn & Suites by Wyndham Hagerstown. The White Hall Manor Bed & Breakfast is situated 16 kilometres (10 miles) from the main part of Hagerstown. Alternatively, the Holiday Inn Express Hotel & Suites Chambersburg is 30 kilometres (19 miles) away. Some other accommodation options around Hagerstown are the Homewood Suites by Hilton Hagerstown and the Springhill Suites by Marriott Hagerstown. For those who are keen to see some more of the mountains that feature in this area, you might also book some time in other places in Western Maryland. You might like to tour the region's sights or go cross-country skiing and rock climbing and then book a convenient place to stay. Cumberland is 90 kilometres (56 miles) to the west of Hagerstown and is where you'll find Allegheny College of Maryland and Windsor Hall. 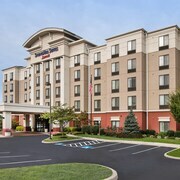 The Fairfield Inn & Suites by Marriott Cumberland and Ramada Cumberland Downtown are some of the Expedia-listed long and short-stay options in Cumberland. 35 kilometres (23 miles) to the southeast of Hagerstown, you may also choose to stay at Frederick, which is home to the TownePlace Suites by Marriott Frederick and Residence Inn by Marriott Frederick. If you stay in Frederick, set aside a little time to visit the Francis Scott Key Mall and Monocacy Battlefield. Hagerstown Regional Airport is a logical airport for accessing Hagerstown. It is 7 kilometres (4 miles) drive away. If you would like to stay nearby, try the Hampton Inn Hagerstown - Maugansville or State Line Inn. What are the most popular Hagerstown hotels? Are there hotels in other cities near Hagerstown? What other types of accommodations are available in Hagerstown? Explore Hagerstown with Expedia.ca’s Travel Guides to find the best flights, cars, holiday packages and more!